Pip's Pastimes: Anyone for a Dance? Oh wow - what a gorgeous and vibrant card. Will brighten someone's day up no end. It's fab. 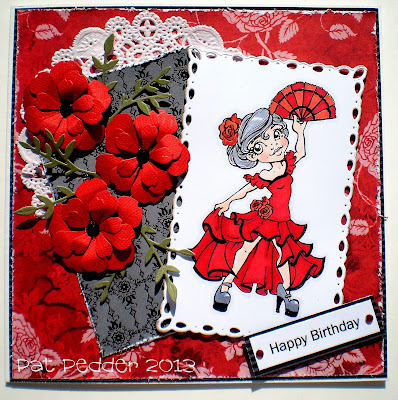 Fab Pat, the hot reds are perfect for the flamenco dancer. This is gorgeous Pat, love your flowers and fab colour combo. Beautiful card Pat. Great colouring on your image too! Pat I love what you have done with this image, so vibrant and dramatic. Fits so well with the Flamenco, I can hear the guitars and castanets from here. gorgeous colouring thanks for joining us over on mayzy art. Yep - I have been missing in action alright! Love your lady in red - and your beautiful red flowers! !